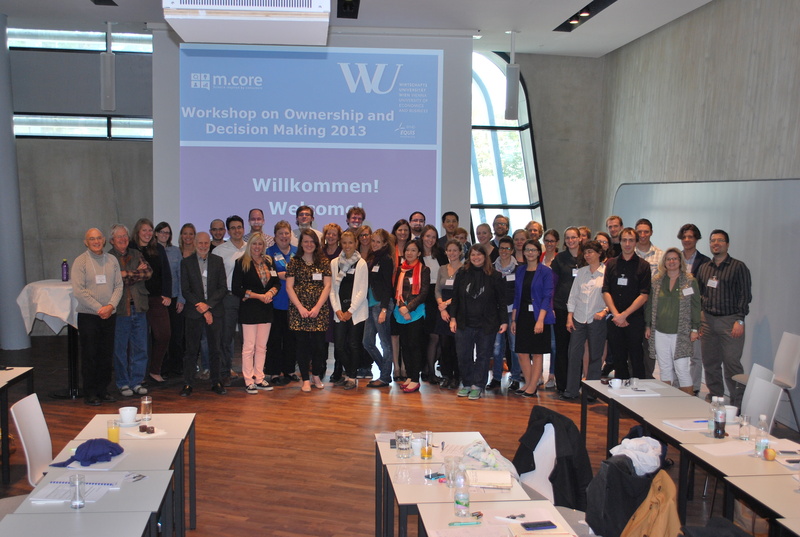 On September 26 and 27, 2013 the Institute for Marketing & Consumer Research at the Vienna University of Economics & Business held a special Workshop on Ownership and Decision-Making. They invited a crowd of 46 internationally renowned researchers from 11 countries to join them for talks and lively discussions on the topic from different perspectives and fields such as economics, psychology and marketing. Jon L. Pierce and Russell W. Belk, who are well known as leading scholars in the field of ownership research, inspired the audience during their fantastic key note presentations. In addition, 15 state-of-the-art talks as well as 19 poster presentations – all of which featured the broad field of (psychological) ownership – were part of the comprehensive and diverse program. Specific topics that were discussed include loss aversion, the endowment effect, tangible vs. intangible goods, ownership as an extension of the self, developmental perspectives of ownership, acquisition models, ownership and mere touch, and historical as well as philosophical aspects of ownership. The main objective of the workshop was to serve as an interdisciplinary platform for the vivid knowledge exchange of different facets of ownership and its consequences for economic and consumer behavior. Further, it intended to unite researchers with different backgrounds but a common interest in the concepts of ownership and facilitating move towards a much-needed unified theory of ownership. The workshop once again demonstrated the huge potential that ownership as a contemporary phenomenon can provide for a plethora of research areas. The workshop was sponsored by IAREP/SABE/ICABEEP (International Association for Research in Economic Psychology/ Society for the Advancement of Behavioral Economics/The International Confederation for the Advancement of Behavioral Economics and Economic Psychology), the Vienna University of Economics and Business and other affiliated local parties (Almdudler, Prodir, Rauch, Waldquelle, WWG).